If you’re searching for a more unique theme when designing your home, why not try the steampunk style? 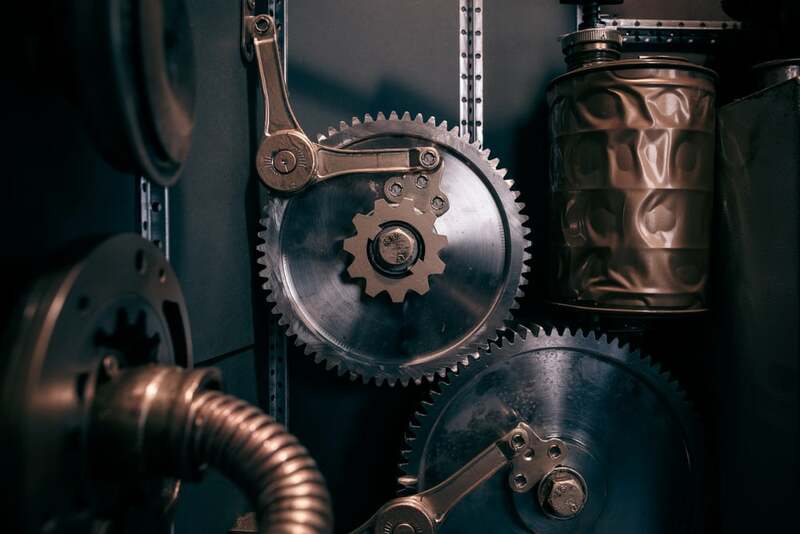 While it’s a bit more unusual compared to other design styles, the steampunk world with its Victorian elements and mechanical gears represents a great solution for making your home stand out. Most people have a rough idea when they hear the word ‘steampunk’, but what are the defining characteristics of this style? 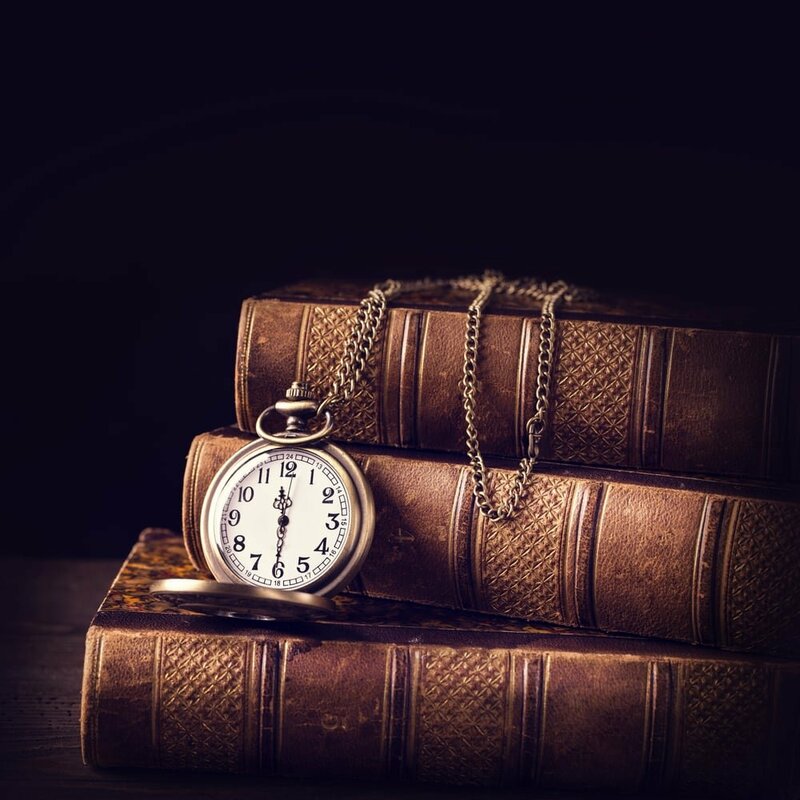 Originally, steampunk started out as a science fiction subgenre and only recently it has started to gain momentum as it was still a fairly obscure aesthetic. The great inventions of the Victorian era come to mind when you try to imagine the essential elements of steampunk. From furniture pieces to clothing and other various items, all try to give off a modern vibe yet without abandoning the central theme of Victorian sensibility. Steampunk tries to mix classical elegance with whimsical machinery and this style can give the interior design of your home a unique look. There’s a decent amount of versatility available when it comes to outfitting your home in a steampunk style. Now that we have a good idea about the potential of this aesthetic to rejuvenate a home, let’s explore some interesting ideas that deliver stylish beauty without leaving out functional features. We’ll see that you can easily find new pieces to buy for making your home more steampunk, but it’s also encouraged to try your hand at some DIY work. Taking older items and adapting them in a steampunk style represents one way to boost the individuality of your steampunk-themed home. The steampunk style benefits the most from the usage of muted neutral colors. The palette should be composed primarily of brown and sepia tones without leaving out dark shades of green and red. Metallic colors can help to balance the overall look. It’s recommended to combine lighter with darker colors for a more contrasting effect. One thing that you should keep in mind regarding the color scheme is that steampunk doesn’t welcome bright colors and bold patterns. 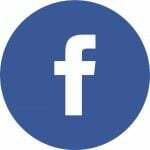 The overall palette is definitely more on the gloomy side though there’s enough versatility to include more elegant and colorful shades apart from the usual grays and browns. For a successful steampunk look, you will need to choose your materials carefully. With the proper materials, you can also set up the background in the right way so you can make future adjustments more easily. For example, you can change elements to achieve the desired atmosphere and make the design feel more cohesive. The main reason why copper should be considered a central material is that it’s very relevant for the origins of the steampunk style. Its rust tones immediately make you remember the industrial revolution. 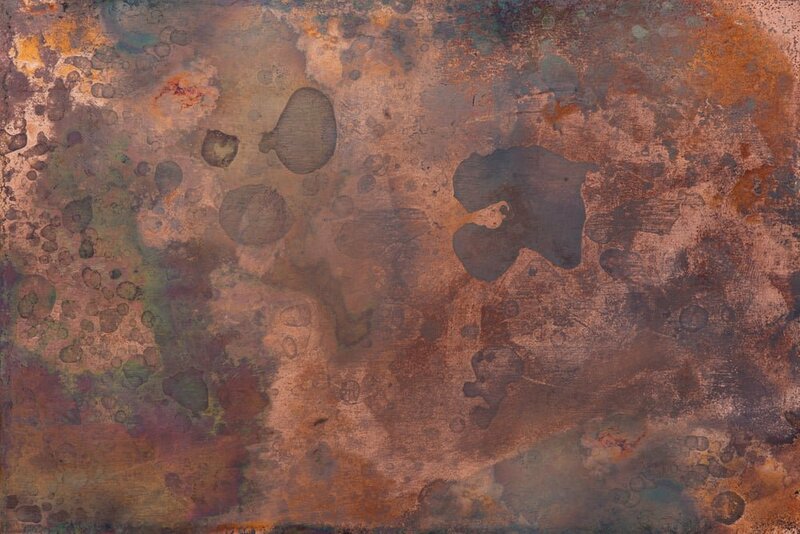 You can use copper in many ways to create a rich steampunk atmosphere. It can be merged with different insertions and you shouldn’t be hesitant when it comes to integrating it everywhere. Real vintage copper creates a true authentic steampunk look, but there’s a major drawback as it can get pretty expensive. If your budget is more limited, it’s recommended to try some alternatives that are less costly while still delivering a stylish aged copper look. If you want a more modern atmosphere in your steampunk home, perhaps integrating shinier copper elements wouldn’t be a bad idea. Mixing up vintage and modern copper can feel a little unconventional, but this is just part of the beauty of steampunk décor. There are no strict rules. You can go for bolder approaches to make your decorations truly stand out. 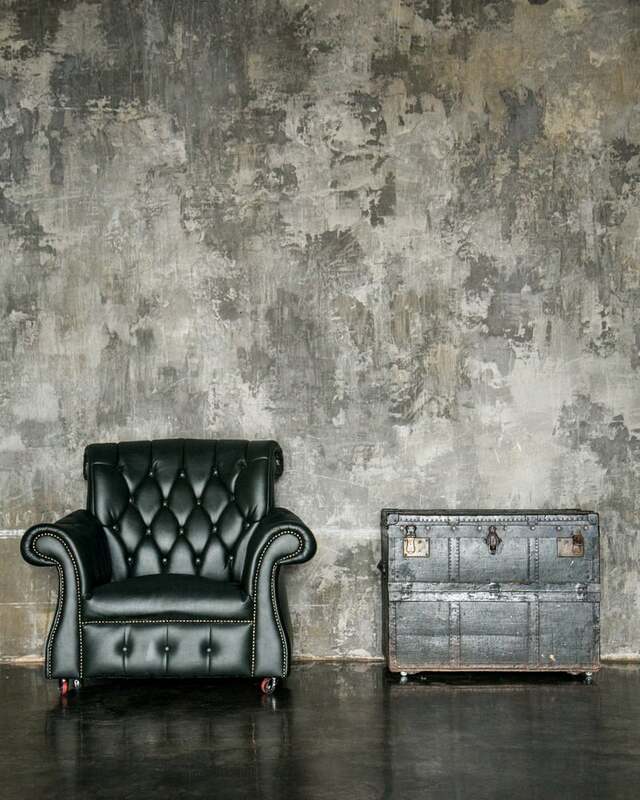 Most steampunk interiors out there probably contain furniture pieces made from natural leather. This is definitely one important material that shouldn’t miss from your decorations. Merging it with other materials such as metal can create a more industrial look which fits nicely for the steampunk style as well. If you’re not a fan of the more whimsical elements, keeping a classical leather piece is a good idea if you only want to insert a few steampunk decorations into your home. 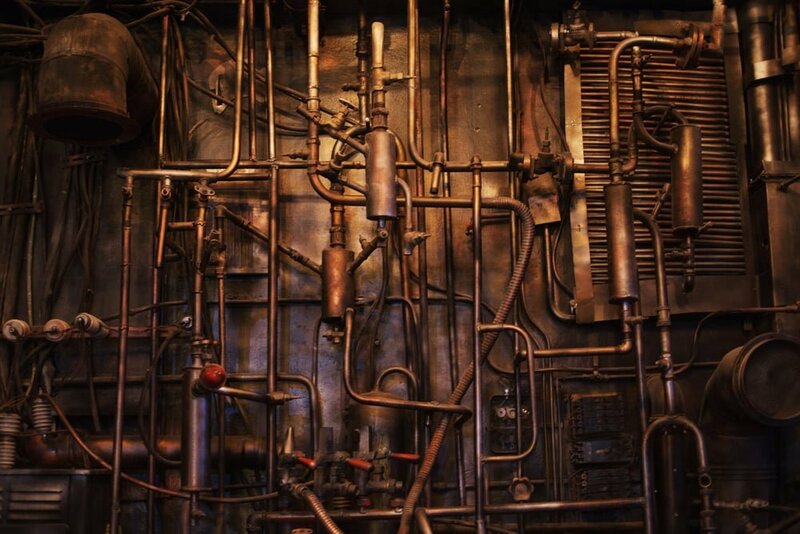 A staple of the industrial style, exposed plumbing is also welcomed in the steampunk style. 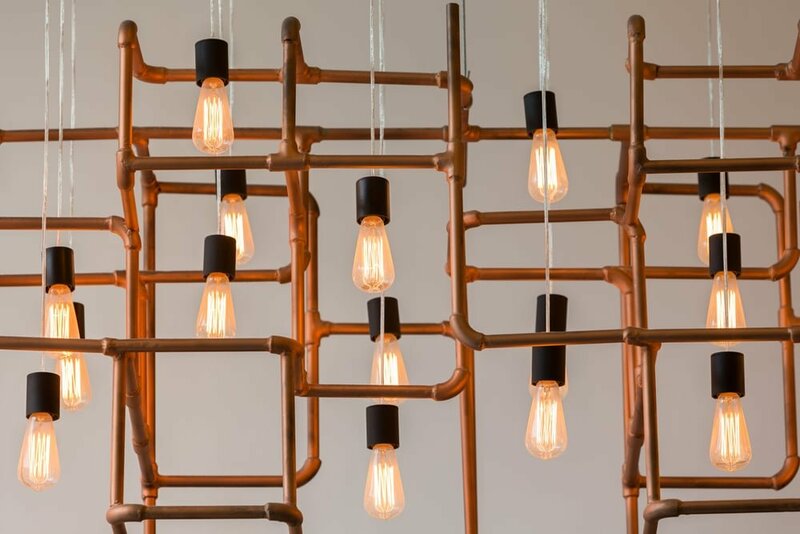 Particularly when it comes to lighting, exposed pipes can create some unique fixtures providing an eye-catching focal point. 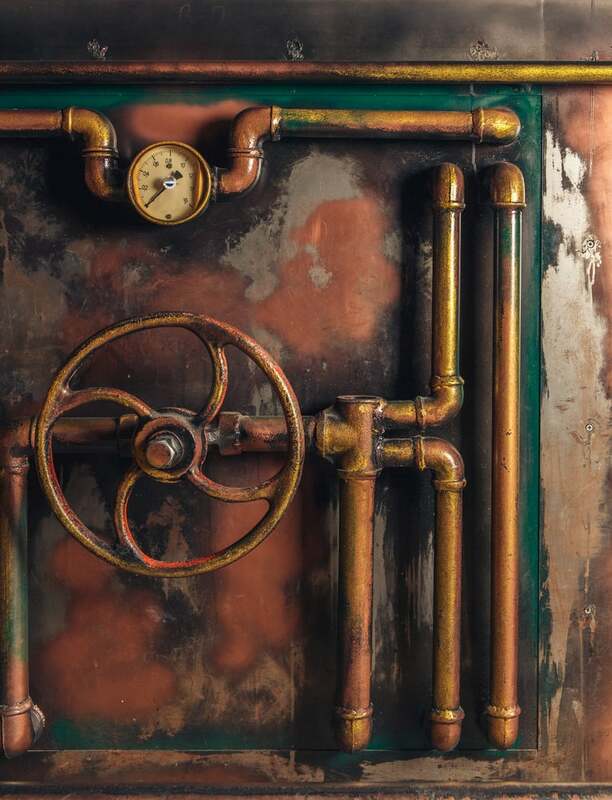 For a more powerful steampunk effect, you can also go for copper plumbing. While this element works great for lighting fixtures, it can also be used creatively in other areas. For example, you can rely on exposed plumbing to serve as a base for a shelving unit. Making an industrial bookcase will certainly boost the steampunk aesthetic in your home. Check out this DIY guide if you’re interested. 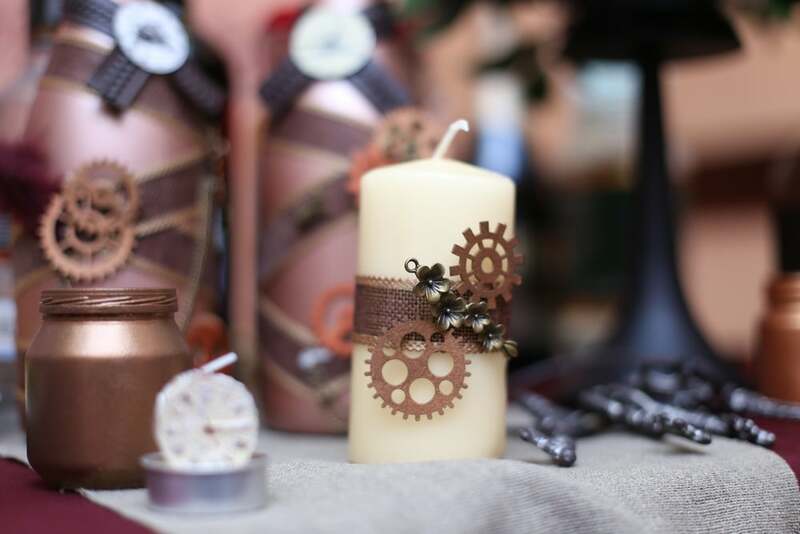 When it comes to decorating in steampunk style, there are few elements more iconic than gears. This culture makes great use of mechanical gears as decorative elements. If you want to get creative, this is one defining element that can help you embellish your walls with industrial art pieces. Take a look at this steampunk clock from Amazon that relies on many decorative gears. Old furniture is sure to add a charming atmosphere to any steampunk interior. The good news is that you won’t have to spend too much on classy antique pieces. A cheaper alternative is to buy secondhand and revamp it to fit your steampunk aesthetic or repurpose it to create a fresh point of interest. For a solid Victorian touch, you could transform an old trunk in a functional storage piece for your bedroom. Or you could use it as a coffee table for a unique steampunk effect. Add a rolltop desk with a matching leather chair in the room to have a quiet place where you can just work or relax. Bookcases can be enhanced with decorative steampunk elements or painted with a vintage finish. Lighting plays a major role in the steampunk décor. It doesn’t just have an important functional purpose, but it’s also utilized to showcase other decorative elements. While not necessarily required, it’s a good idea to have a fireplace with a rough finish as it can bring an industrial flavor to any steampunk home. Using incandescent lights represents a great method to accentuate the steampunk motif. Hanging some cool looking light bulbs near exposed brick enhances the aesthetic effect. The same thing can be said when illuminating roughly finished wood pieces. If you want a good example of a steampunk lighting fixture, check out this rustic copper light. Edison light bulbs are also recommended as they match the Victorian aesthetic of this design style. The terrestrial globe is a classic steampunk item. An antique model can really blend nicely with the rest of your steampunk decorations. Continuing with the world exploration theme, hanging old maps on the wall is also another solid decoration idea. 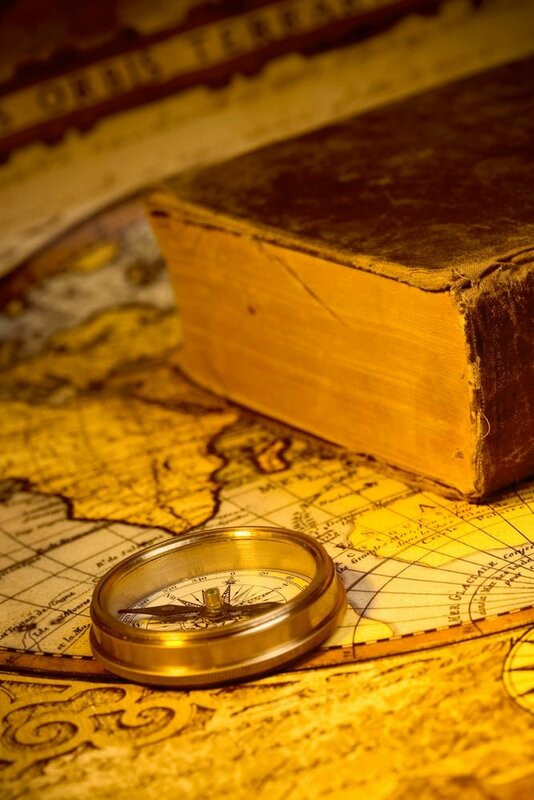 As with the globes, if your maps look very old, the steampunk atmosphere is greatly enhanced. Here’s a vintage map print from Amazon to help you decorate the walls in steampunk style. 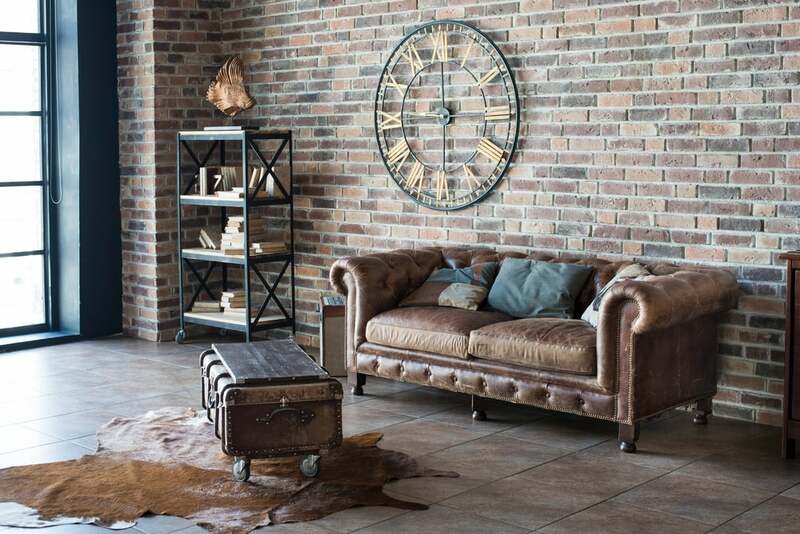 We’ve mentioned how leather represents a staple material when it comes to decorating in steampunk style. 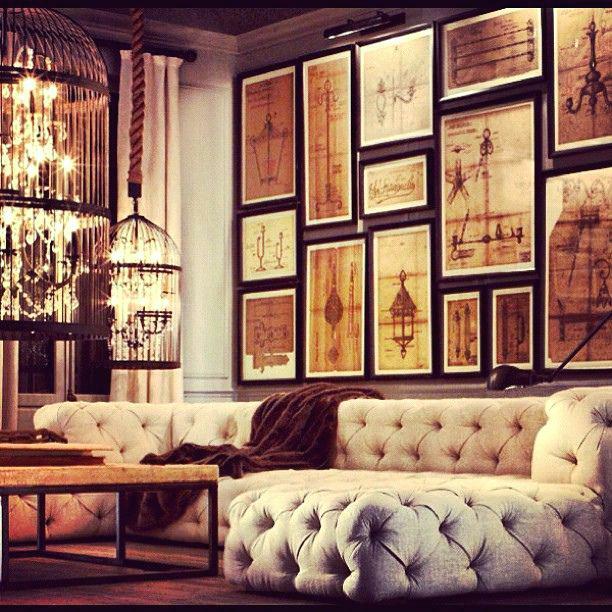 The best way to incorporate natural leather is by using elegant sofas or chairs. The refined touch of a leather furniture piece draws inspiration from the Victorian era and you will also be pleased by the comfort. 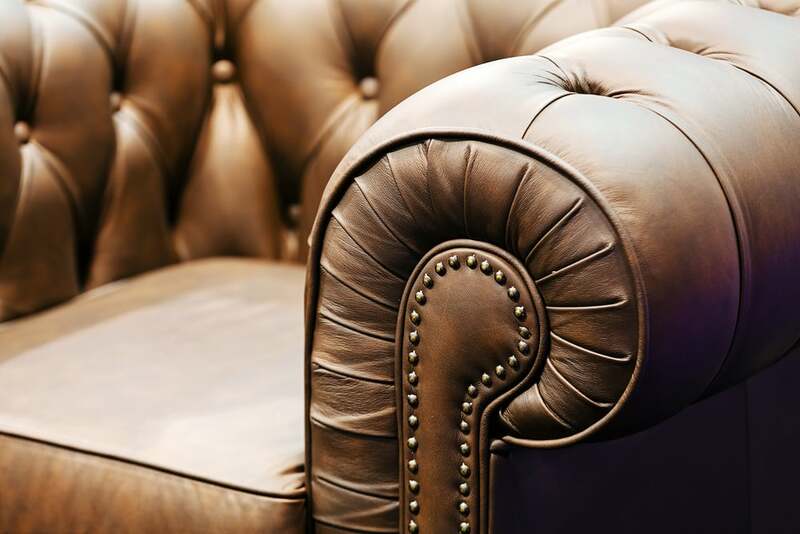 Showcasing your leather sofa can add some much-needed luxury to any steampunk home. Aside from using gears and old maps, there are other steampunk-themed pieces you could use to make the entire room decorated in this style. Using sepia images represents a good solution as old-looking photos match very well the steampunk settings. While pieces can be bought, there’s also the option to print your own creations or old family pictures. If you’re a DIY enthusiast and want to have some more unique wall decorations, there’s the option to incorporate a Victorian pattern in an imposing art piece. 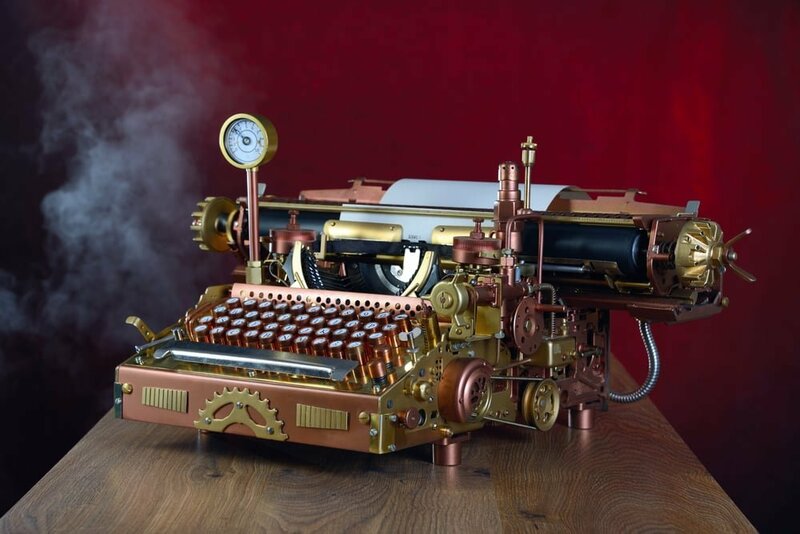 Painting your own wallpapers may not be ideal for anyone, but if you have the skills, you should consider mechanical inventions from steampunk literature to get inspiration. 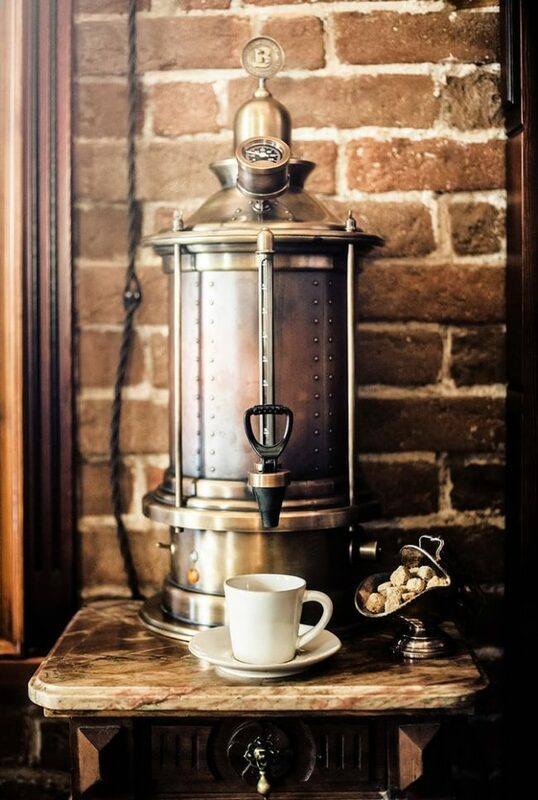 Many vintage elements can add a steampunk vibe in your home. Decorating using old books makes for a tasteful addition to complete the overall décor. Try to focus on old hardbacks with stylish leather covers if you really wish to make them stand out. 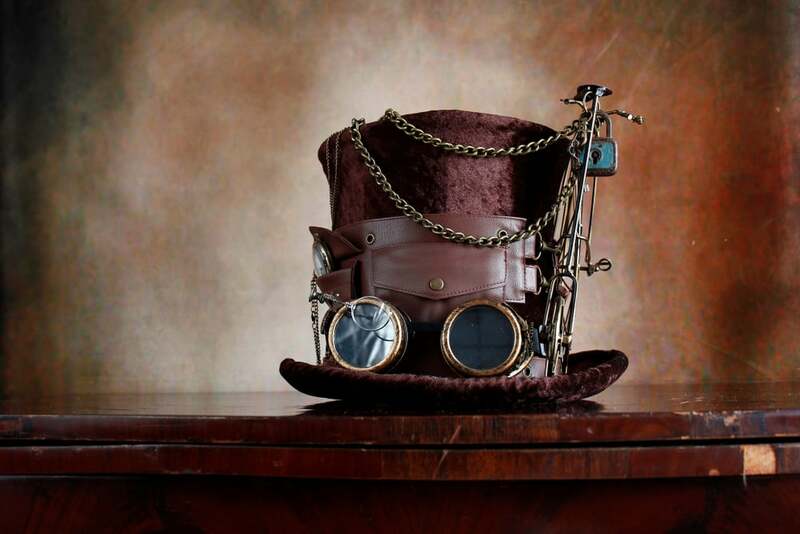 While steampunk cosplayers prefer these whimsical hats to accentuate their outfits, bowler and top hats in the Victorian style can be used as decorative pieces for your home as well. Any room can benefit from the classy look created by hanging some steampunk hats. With the help of technical and anatomical drawings, you can make the room more steampunk. Sketches with lots of details are definitely important considering the Victorian era inspiration. Don’t hesitate to expose detailed drawings or other antique items which have an interesting story to tell. One important steampunk theme is the love for crafty tools and strange inventions and gadgets. This is why you can decorate your home with ease by visiting antique shops and looking for things like telescopes or typewriters. It doesn’t matter if they’re no longer functional as you only need to focus on their decorative purpose.